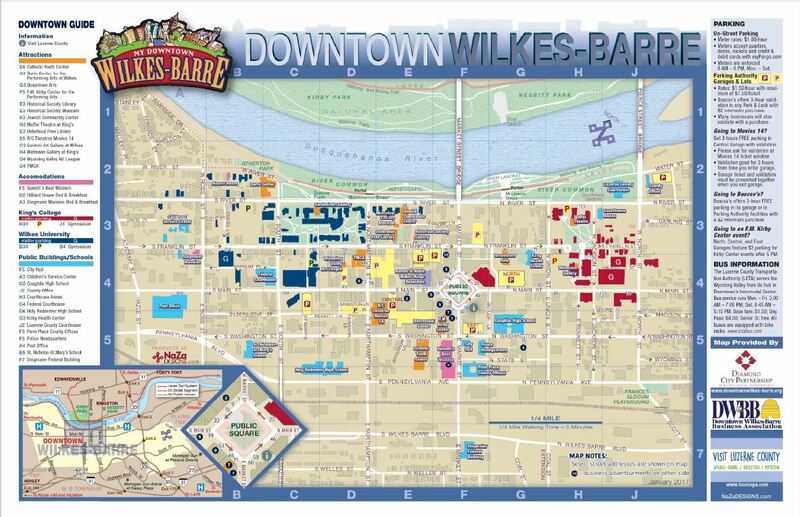 The Diamond City Partnership, Wilkes-Barre’s public-private alliance for downtown revitalization, held a Downtown Design Workshop during the final months of 2003. The Workshop was organized in conjunction with DCP’s development of a Strategic Market Development Plan for Downtown Wilkes-Barre. The Workshop was co-sponsored by the Northeastern Pennsylvania Chapter of the American Institute of Architects. To generate a collection of alternative design concepts that can help us visualize Downtown’s potential as expressed by the Strategic Market Development Plan. To use a collaborative process to tease out creative ideas for Downtown Wilkes-Barre that might otherwise be overlooked. To develop consensus about Downtown’s future physical form, developing some fundamental urban design principles to guide Downtown development. While many of the specific ideas developed during the Design Workshop will never become reality, the concepts emerging from the Workshop will provide the DCP and the City of Wilkes-Barre with a common basis for planning and evaluating future Downtown Development. We also created five work teams, led by local architects. Each team was randomly assigned to a different slice of Downtown, and worked together to explore possible development and reabilitation opportunities – ranging from streetscape improvements to new buildings – for their slice of the city. The Market Development Plan, which analyzed the types and amounts of development that can be currently supported in Downtown , served as a “reality check,” and the consultants were present to work with each of the teams throughout the day. By the end of the day, we had produced the beginnings of a new, collaborative vision for Downtown Wilkes-Barre, documented in drawings by the design professionals. The Workshop was bookended by two public meetings attended by hundreds of local citizens – one held to receive input prior to the design charrette, and one hold after the charrette to get feedback on the results. DCP wishes to acknowledge the skill and expertise of our local design community. Specifically, we want to recognize the Northeastern Pennsylvania Chapter of the American Institute of Architects, our partners in the Downtown Design Workshop. We want to thank the following architectural firms for their participation in the Downtown Design Workshop.